Chef J has been making this delicious pecan pie for the family for almost a decade. It is his number one most requested holiday dish, and for good reason! Pecan pie is a classic staple on any Thanksgiving table, but this one will have your guests thinking, “well, maybe just one more slice!” You should probably make two, just to be safe. Take it away, Chef J! The leaves are falling, the weather is cooling down, and the relatives will soon be arriving. With a house full of family, friends and lots of food it’s easy to get into the holiday spirit. And if the in-laws are visiting it might be time to get into the holiday spirits… So here is a recipe that gives you a good excuse to open a bottle of bourbon. It’s a proven fact that pecan pie is the best pie ever, but like I always say: chocolate makes it better! The bourbon lends a nice, rich, caramel flavor to the filling (don’t worry, the alcohol will cook out), and adding booze instead of water will give your pecan pie a flakier crust since it evaporates much faster. Your family will rave about this Chocolate Bourbon Pecan Pie and ask you to make to make it every year! In a food processor combine dry ingredients. 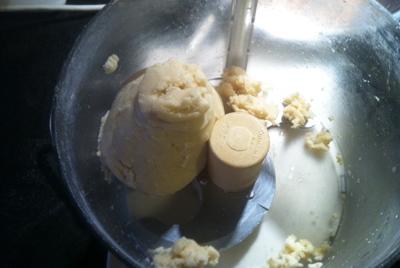 Add butter and shortening, pulse for about 10 seconds. Slowly add the bourbon while mixing until everything pulls together into a ball. Roll out the dough and press evenly into a pie dish. Refrigerate for at least 30 minutes. Perforate the dough and bake for 15 minutes. Combine all ingredients in a double boiler over low heat and cook until the chocolate has melted. Pour filling over the pre-baked dough. Bake until set, about 30 minutes. Give it a gentle shake after about 25 minutes; you don’t want too much jiggle! Remove and let it cool completely before cutting. 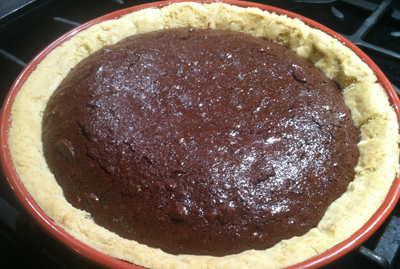 Top with more nuts and chocolate, whipped cream, or vanilla ice cream!